Kelly shared these reviews with us. Her sons have multiple food allergies, including peanuts, tree nuts, egg, dairy, sesame seeds and bananas. 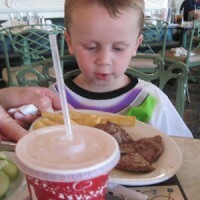 One of the reasons I initially wanted to take the kids to Disney World was I had heard they accommodate food allergies. This is always a huge stress for me when we travel. 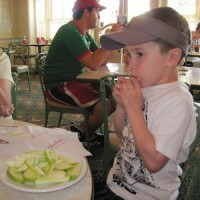 Disney has food allergy policies in place that really keep there guests safe and relieve some of the stress. 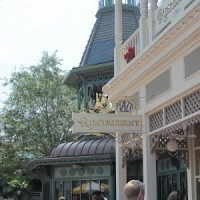 I made restaurant reservations on Disney’s website. When making the reservation I was asked to check off which allergies are in my party. Then I was told to contact Special.Diets@DisneyWorld.com and they sent me forms to fill out. Those forms were sent to each restaurant. They then sent a confirming email and asked that when we got to restaurant to mention the allergies once again and the chef will come out and talk to us. 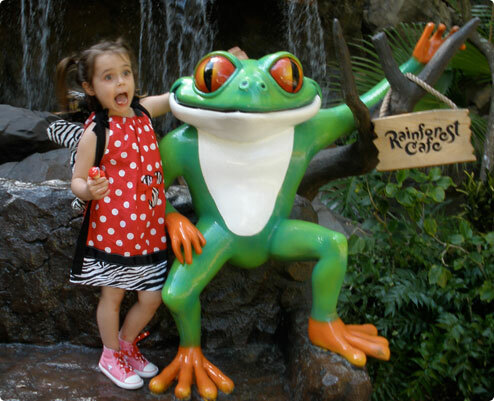 The following is our experience at Downtown Disney, Magic Kingdom and Hollywood Studios. We informed our server, Shawn, that we had two kids at our table with food allergies. He sent out the chef. 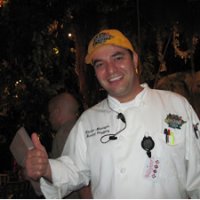 Chef Richard assured us Nolan could have the chicken tenders and that he would make something special for Sean–two plain hamburgers and fries that would cooked in a separate part of the kitchen. After a long day at the pool, these boys cleaned their plates—so did the adults, the food was good. 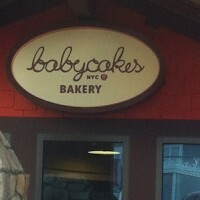 One of the main reasons I wanted to check out Downtown Disney was Babycakes NYC. This wonderful bakery is peanut and tree nut free, egg-free, dairy-free, gluten-free, soy-free, sesame seed-free. Correction by AFM: BabyCakesNYC does not claim to be peanut free or tree nut free, due to the way their gluten-free flours are packaged. I told Sean that this was a very special safe bakery and that he could pick out whatever he wanted. He couldn’t believe his eyes. 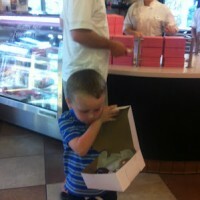 Sean ended up with two cupcakes, some chocolate chip cookies and chocolate frosted donut. He has never had a donut! We brought the box of treats back to the hotel and he saved one for each day. He was so happy. Mumma was so happy. The first day in the parks we went to lunch in Magic Kingdom at The Plaza Restaurant. This time two chefs came right out, armed with a book of everything they served and all the ingredients. Nolan settled on a grilled cheese and Sean once again had a hamburger. We were again assured that it would be cooked safely in a separate part of the kitchen. They brought out some apple slices and crayons to keep little hands busy, while we waited for our food. Sean cleaned his plate once again. Sean could even have dessert. 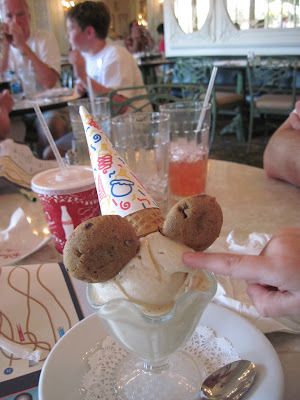 They had Rice Dream ice cream, a dairy-free treat that he loves, with Enjoy Life cookies for ears! 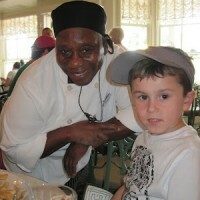 The next day we had lunch in Hollywood Studios at The Backlot Express. 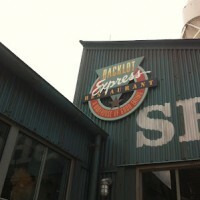 The Backlot was an express type restaurant, which I was a bit apprehensive about. 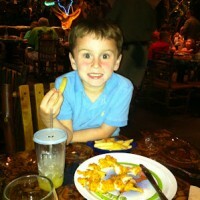 Every restaurant, express and sit-down, has a food allergy book, as well as every snack stand. Even the popcorn stand had a book. Sean and Nolan could have the popcorn too. All-in-all we had great experiences eating in Disney World. 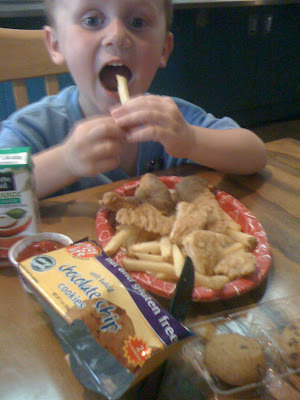 Sean and Nolan eat like kings! 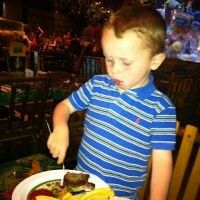 Thanks to Kelly Lessard for sharing her Disney food allergy dining experiences. You can read more about her family’s food allergy adventures at her blog. If you found this review useful, please give her a Thumbs Up! 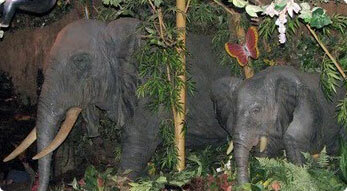 The Rainforest Cafe has two locations at Disney World, in Downtown Disney and outside the gates of the Animal Kingdom theme park. We’ve eaten at the Animal Kingdom location twice. They serve breakfast, lunch and dinner in an atmosphere that includes trumpeting elephants, howling monkeys and gorillas, plus an occasional thunderstorm — it is a rainforest, after all. It’s very fun and exciting for everyone. They have a mega gift shop filled with stuffed animals, games, clothing, toys and more. They have an old fashion photo booth to take pictures. Be prepared – everyone will want something from the gift shop! 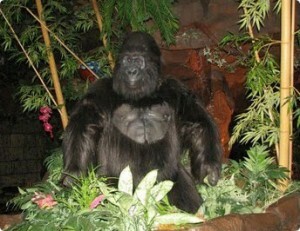 The Rainforest Cafe is not owned by Disney, however, they were very knowledge about food allergies. The waiter understood immediately that he needed to be careful with our daughter’s food. He also asked the chef to come by and work with us directly on her meal. He prepared her nachos with grilled chicken, black beans, salsa, lettuce and guacamole. She loved every bit of it. 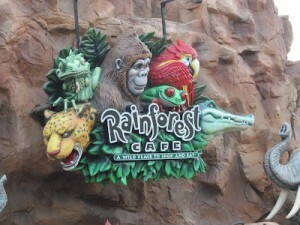 UPDATE 5/19/2011: Rainforest Cafe has changed the ingredients in some of their food items. Black beans now contain butter and corn, and the guacamole is no longer considered free of dairy cross contamination. If you’ve eaten here with a food allergy, please comment or send us your experience. You’re tips and advice will help many others enjoy the magic of Disney. As with any other restaurant, you should always discuss your allergy with the chef or manager upon arrival at each location. NOTE: These items are subject to change without notice. Please speak to a chef or manager upon arrival at each location for their most up to date information on their ingredients and menus. This information has been provided by Disney, requested an updated copy. 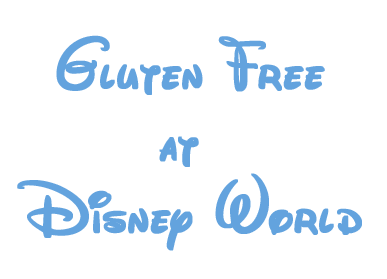 Erin McKenna’s Bakery (formerly Babycakes NYC) – This vegan bakery specializes in gluten, dairy, egg, and soy safe options. Read our Babycakes NYC review. Order food allergen-free cakes for delivery to Walt Disney World resorts and restaurants. Call 407-938-9044 at least 7 days (or more) before your dining event. NOTE: Menus subject to change without notice. Please speak to a chef upon arrival at each location. 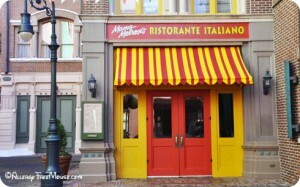 Disney World has dozens of Casual Dining Restaurants, most of which can accommodate your food allergy. Food allergens mentioned in the reviews are listed below each restaurant name. Old-fashioned American comfort food. Every table is in Mom's kitchen. Quick service fast-food like chicken curry, chicken bleu sandwich and fish & chips, Angus cheeseburgers and chicken nuggets. Continental style, a la carte breakfasts. In the evening find a selection of premium liquors, beer and wine. Seafood, sirloin and game in a rustic restaurant. Ice cream sundaes, smoothies, floats and other sweets. Quick service movie studio-prop shop café with vegetarian and turkey sandwiches,cheese burgers, chicken strips, salad with chicken, or hot dog. German food, entertainment and year-round Oktoberfest. 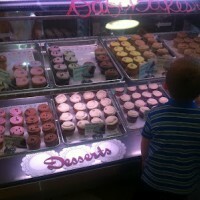 Assorted cakes, pies and pastries baked fresh onsite daily. Tastes of Africa. Buffet, table service. Styled as a lively 1950s Havana nightclub, serving authentic Cuban concoctions. Created by Gloria Estefan. Quick service in France, serving sandwiches, quiches and French pastries. Fresh salads, panini and freshly baked goods. All-you-care-to-eat buffet or à la carte breakfast. Steaks, sizzling seafood, chops and more later in the day. Hot dogs, fries & drinks. Snacks and beverages, including fruit slushes. American cuisine infused with Mediterranean flavors, such as seafood, steaks, pasta and vegetarian options. Sandwiches, salads, clam chowder, fish and chicken. Flatbreads and hot and savory sandwiches, like honey lime chicken. Gourmet coffee drinks, smoothies, beer, wine and specialty liquors. Classic Irish fish 'n' chips, tasty pies and more. Seafood restaurant near the Land. Dine while viewing underwater views of The Living Sea coral reef. Burgers, chicken, BBQ ribs, soups and salads, with far-out flair. Soft-serve ice cream and novelty ice cream treats. A full-service restaurant and bar that specializes in beer, burgers, wings, and sandwiches. Fresh fish and seasonal ingredients are key to this fabulous New American cuisine. Freshly-brewed coffee and coffee products by Joffrey's Coffee. 2 locations. Quick service ice cream parlor. Hot dogs, sandwiches and hand-made chips. Gourmet Mexican dishes by celebrity Chef Rick Bayless, including bacon guacamole, red chili chicken enchiladas and the coconut lime quattro leches cake. 24-hour arcade and restaurant, featuring sandwiches, salads, pizza and burgers. Quick service featuring snacks and LeFou's Brew. Chocolate and world-famous sundaes topped with fresh, homemade hot fudge. 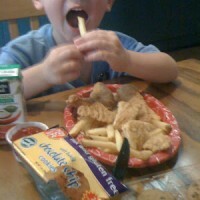 Chicken breast sandwiches, chicken nuggets and flatbreads. American fare overlooking the gardens and pool. Beautify wood-paneled restaurant featuring the Brown Derby Cobb salad, seared steaks, grapefruit cake and classic cocktails. Hand-dipped ice cream cones, sundaes and chocolate-chip cookie sandwiches. Enjoy performances by regional and national gospel groups while dining on Southern cuisine. Southern cuisine is served in a live music club setting. American casual cuisine and cocktails. Casual restaurant featuring grilled ginger-crusted ribeye steak, macadamia-crusted mahi mahi and other traditional American fare. Coffee, tea, pastries, and fruit in the morning. For dinner, sushiincluding Volcano Roll, Shrimp Tempura Roll, Sashimi, Tuna Poke, and Nigiri. Plus cocktails, wine, and sake. Norwegian quick service, featuring smoke salmon sandwiches and other fast food. Mexican quick service on the World Showcase Lagoon. Features tacos, empanadas and nachos. Fine dining in the Canada Pavilion, designed as a castle's wine cellar. Quick service in the American Pavilion featuring cheeseburgers, chicken nuggets, hot dogs, salads and more. Quick service with healthy snacks. Hearty New England style lunch dishes. Chinese quick service featuring potstickers, egg rolls, orange chicken and more. Quick service bakery with ice cream sundaes, cookies and confections. Now featuring Starbucks coffee and food items. Casual Italian dining featuring brick-oven-baked pizzas, pastas, chicken, crispy calamari and seafood. Nuevo Latino cuisine and classic American favorites. Pan-Asian cuisine from Chef Morimoto of Iron Chef America. Features Maine lobster, Alaskan salmon and filet mignon while overlooking the Magic Kingdom. Chinese cuisine in a contemporary Asian restaurant. Funnel cakes with your choice of soft serve, strawberry or whipped cream topping, powdered or cinnamon sugar. Ice-cold beverages. Your favorite cocktails can be found here. Featuring North, Central and South American cuisine, plus a huge tequila bar and nightly entertainment. Cheeseburgers, BBQ Sandwiches, Chili-Cheese Fries, wraps and salads. Buffet-style dining for breakfast and lunch, and a quick-service dining experience at dinner. Mac & cheese, PB & J Sandwiches, pizza, fries & desserts. Pizza pie by the slice. Traditional American favorites in this star-themed casual dining atmosphere. 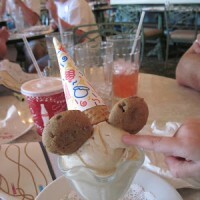 Hand-scooped ice cream, floats, waffle-bowl sundaes and Mickey cones with chocolate ears. Authentic Italian cuisine and fine wines. 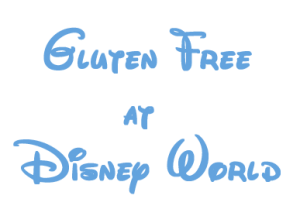 If you would like to share your allergy-free Disney dining experience with other readers, please submit your review here.